We welcome Elliot Litrowski as newest member of the Moustache Records family. 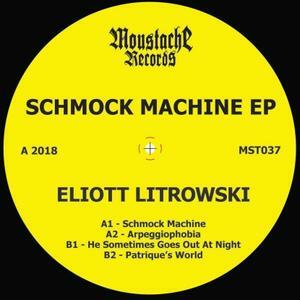 His debut called Schmock Machine EP will be released as Moustache Records 037. The EP title track song Schmockmachine is an uptempo tr707 beat, a really strong arpeggio, deep smooth strings with top break… A2 Arpeggiophobia moog synths, deep basslines and deeper strings topped with hipster plastic drums. B1 He somtimes goes out at night is a powerfull track with pumping tr-707 beat, obvious italo strings, some acid, a mega party break and an Alden Tyrell kinda bassline already played by label owner David Vunk himself a numberous parties. B2 Patrique;s world a more slower beaytifull track with cowbells, sharp snaredrums and a very niche bassline, some flanger hi-hats and there you go. Again a top quality release for the dancefloor.. be prepared for the killer EP. Do not play this under 16 years old. gone is gone… this is a TOP HIT!